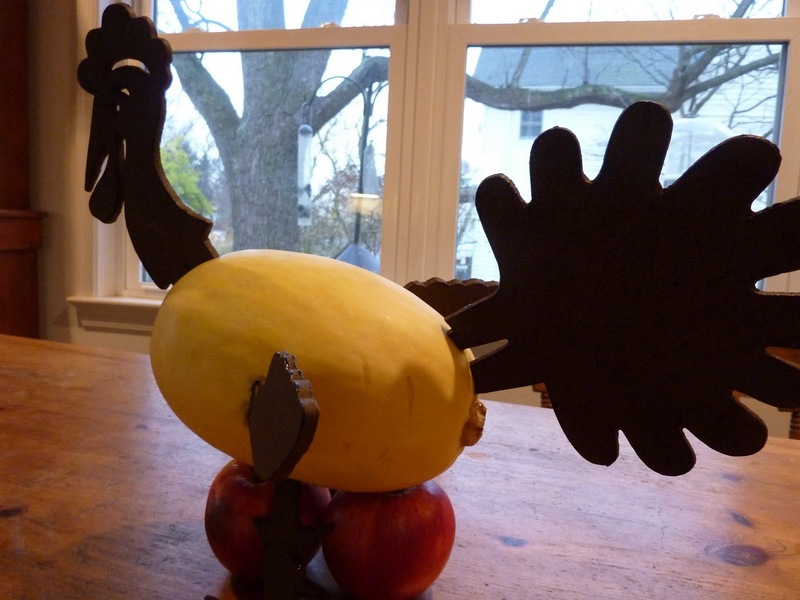 I wish it was my home-grown squash, but it is local – and so are the apples holding up the construction since the metal legs aren’t strong enough, and so is the real turkey I’ll be putting in the oven soon. The only “home-grown” element of today’s meal will be the last enormous sweet potato of the demo garden harvest, and the herbs for the stuffing. Better next year! How about you? What’s going into your Thanksgiving meal that you grew yourself, or bought from a local source? 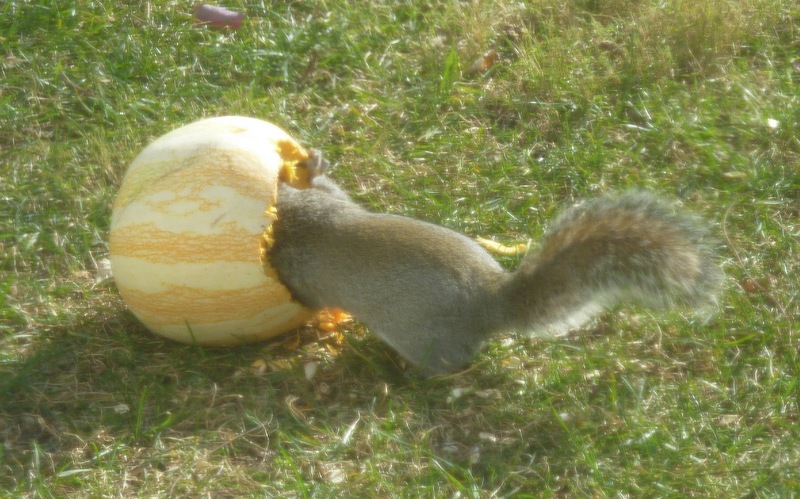 While we’re doing vegetable-animal hybrids, here’s what happened to the tougher part of that cushaw squash. The squirrels are thankful that we feed them. And I’m thankful to be able to show you silly pictures, and grow my own food and chat about it. Thanks to all of you for reading, and Happy Thanksgiving! Sweet potato bisquits to go with Virginia ham, curried pumpkin soup, Swiss chard and feta wrapped in phyllo, Rappahannock River oysters will be on our Thanksgiving table. All veggies home grown ham and oysters from Virginia. Maybe our hosts will have Maryland wine. Happy Thanksgiving to you and thank you for sharing your stories with Maryland's gardeners! Pie made with cortland apples from the farmers market, mashed Yukon Gold organic potatoes from a local grower, also purchased at the farmers market. Sister-in-law provided a locally grown turkey (which was very tasty), brussel sprouts, baked squash, and beets. A good and pleasant meal with niece and nephew as well. And three dogs. We've survived our feast for 20, including our twin 3-year-old grand-nephews, true bundles of non-stop energy. Everyone contributed to the meal, but, alas, little came from our own garden. But that one dish is always popular–ruby-red chard sauted in a little olive oil with onion and garlic and then topped at the last moment with juice of a lemon and some chopped pecans and crumbled feta. Other relatives brought home-grown dishes too: pickled beets and pole limas and sweet corn by relatives in Jersey. Thank goodness for Black Friday–not for shopping–but for napping. I made brussels sprouts sliced and sauteed in bacon fat with honey, soy sauce, shallots and pecons; sweet potato and apple casserole; sweet and sour onions; wild rice dressing; the cranberry apple chutney Bob linked to; and pumpkin pie with the remains of the warty pumpkin. Yum! All your meals sound great too. The only shopping I'm doing today is for bird seed. ha ha! what a cute photo.